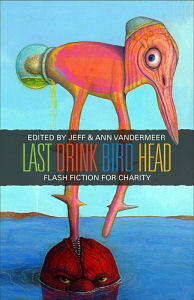 A charity anthology for literacy, edited by Jeff and Ann Vandermeer. <!– This entry was posted by Jeff VanderMeer on Wednesday, August 19, 2009 at 11:45 am	and is filed under News. You can leave a response, or trackback from your own site. Ragazzi del Juke-Box: The Italian musical is a genre that has received very little attention. To my knowledge, not a single one of these films has ever been brought into English with subtitles. This one, made in 1959, is quite good, featuring a lot of footage of Adriano Celentano and subsidized by the very humorous Mario Carotenuto. The lead is played by Anthony Steffen, before he became a spaghetti western standard. Juke box urli d’amore: This is a sort of “part 2” of the previous film. The story is totally different, but it also has Adriano Celentano and Mario Carotenuto. This one is actually superior to the previous, as the screenplay is very well done. The first film had Anthony Steffen before he turned to Spaghetti Westerns, and this one has Terence Hill before he gained fame in the same. Hibotan bakuto: jingi tooshi masu (Red Peony Gambler 8): Being a big fan of Red Peony, I have to say I was disappointed in this entry. A lot of melodrama and not enough action. Il bandito dagli occhi azzurri: A pretty good Franco Nero heist film. Worth a watch. Squadra antifurto: Another Nico Geraldi entry, starring the great Tomas Milian. Not the best in the series, but certainly with some laughs. Madamigella di Maupin: Another Tomas Milian film. This is a historical piece based on the book by Gautier. Definitely watchable. Pelle di Bandito: A great film about bandits in Sardinia by director Piero Livi. The cinematography is outstanding and there are some moments that really raise this one to world class cinema. The strange thing is that the same year this came out (1969), another film by Carlo Lizzani starring Terence Hill called Barbagia was issued, which has almost the exact same plot. One was clearly ripped off whole sale from the other, and I am inclined to think Lizzani was the one who took Piero Livi’s film and made a more popular version. In any case, Livi’s film is superior. You are currently browsing the Oxygen blog archives for August, 2009.